I tried piecing the circles and it’s quick & easy. I used the Easy Circle Cut ruler by Sharon Hultgren. The 5″ circle works for the set in circle and the 4″ circle works for the background. 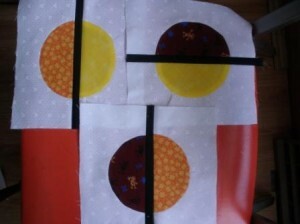 Then I press the directions in both the circle & background, pin and sew .25″ seam allowance. I haven’t re-sized the blocks yet to 7.50″ but here are the 1st 3. They maybe more if I can find more maroon fabric in my stash. We all seem to be missing maroon in our stashes … you can always use the same maroon combined with different yellow or orange. I was going to offer the pieced circle as an alternative, but when I’ve done that in the past, only one person ever tried it. You did a great job. Your finished circle size is 5 inches, right? Ps. If you decide to make more, how about taking some photos and blogging the process for anyone who’d like to try it? And yes, it comes out a perfect 5″ circle as long as you use a good .25″ seam allowance. I like using the walking foot but I’ll use what ever foot is on the machine, too. If you have a circle ruler, you should also get the smallest rotary cutter. A regular size rotary cutter is hard to get smooth turns. Well worth the cost and what quilter doesn’t like more tools in her apron? I was kicking myself on the way home today because I spent three hours in a quilt shop (I taught the silly strings technique to a small guild of modern quilters) and meant to look for that ruler there. I have a different circle cutting ruler (and a small rotary cutter) and am going to see if it will work so I can give it a try. There’s also Dale Fleming’s method for the “6-minute circle” that uses freezer paper.